Airport Grocery in Cleveland, Mississippi was actually once a grocery store until the 1960s, when it was converted into a barbecue joint, where one could enjoy good food and hear some great blues at the same time. 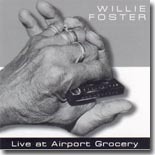 One of the regular performers there for many years was the harmonica player, Willie Foster. To say that Willie Foster lived the blues is like saying Babe Ruth hit baseballs. Foster was born on a cotton sack in the middle of a cotton field near Leland, Mississippi, after his mother went into labor while picking cotton. His family was so poor that Foster sometimes had to wear sacks tied on his feet for shoes, and he was forced to quit school in the fourth grade. At seven years old, he bought his first harmonica for a quarter with money he earned from hauling water to the fields for two weeks. He moved up north and worked in the auto industry until he was drafted for World War II. He first performed onstage while in the Army in London. When he returned stateside, he met Muddy Waters and sometimes played with him during the 1950s, but he returned home to Mississippi in the early ’60s to care for his dad, who was recovering from an auto accident. He continued to play the blues, however, in joints all over the Delta. A New Zealander heard Foster during a trip to the Delta and encouraged him to go there and play for three months. When he returned, his career took off and he even got an opportunity to record. This path to wider recognition was not without a few bumps, however, while in New Zealand, he was stung on the leg by a jellyfish, an injury which eventually caused the amputation of the leg. A few years later, he lost the other leg to diabetes (but recovered sufficiently to play a concert TWO DAYS after the surgery). He also began to lose his eyesight during this time as well. None of these issues, any one of which would have been calamitous to the average person, ever stopped Foster from playing the blues. In 1999, Mempho Records released Foster’s Live at Airport Grocery, documenting one of his regular shows at the club, backed by his group, the Rhythm and Blues Upsetters. This recording, one of the best of 1999, has been a definite collector’s item over the years because Mempho closed shop several years ago. Fortunately, I55 Productions recently reissued it, so blues fans can finally hear what they missed the first time around. Foster also wrote a couple of the songs…..“My Dear Old Dad” is a tribute to his dad and the optimistic “Love Everybody.” The album opens and closes with instrumental jams. “Just Messin’ Round” and “Willie’s Boogie” allow Foster ample space to blow and guitarists Charlie Ricker and Skeeter Provis both to shine. The rest of the Upsetters also contribute mightily to the performance. Mike Ray does an excellent job on keyboards, and the rhythm section (Donnie Brown – bass, Frank Vic and Larry Wright – drums) keep things tight. Foster passed away in 2001 at age 79, just hours after playing a private party in Jackson, Tennessee. Only the Creator Himself could stop Willie Foster from playing the blues.